The scene is the Pacific Theatre of Operations, the time is World War II and the task is to win at any costs. 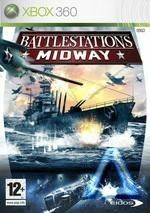 Battlestations Midway is one of those games that have struck a nice balance between action and strategy, pulling it off in such a way that gamers from either side of the fence should be pleasantly surprised. 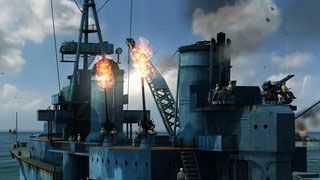 Battlestations Midway puts you in the boots of Henry Walker and his rise from lowly recruit beginnings to eventually taking over the command of the largest battleship on the pacific. The game moves along at a decent pace and is varied enough that it will keep gamers busy for quite some time. 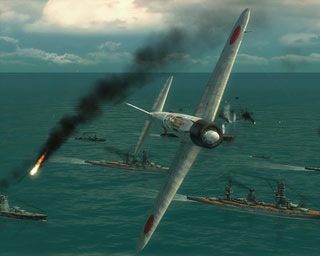 The range of vehicles in this game is amazing and you have the opportunity to control all of them, ranging from aircraft, to submarine to ship, all the whilst making sure you are on top of the battle as a whole. The way to do this is with your tactical map which will allow you to command all your units at once. There is a slight learning curve of about 40 minutes to truly get the hang of this and use it effectively. Once the map is mastered however, it does help greatly and allow you to have a lot more fun playing the game. During battles the really cool thing is that you can take over individual stations at will, going from being the overseer, to one of the troops firing a fixed position gun on a ship, or engaging the enemy in the skies, or even deep below the ocean firing torpedoes. It is truly amazing, the whole setup. The only problem I found is that once the battles get more intense, it was getting harder to enjoy the smaller individual moments of the fighting as you would miss what was going on in the big picture; a mistake that you really don’t want to make. Graphically the game is nice to look at with quite an amount of detail thrown in considering just how much can happen on screen at any given time. Ship and other craft can suffer damage during battle that if you are on the ball you can repair or if you miss the opportunity you can also lose your ship so make sure that your guys are out there fixing stuff. It doesn’t take too much game time to do and will keep you fighting. All things said and done, Battlestations is a really fun game to play. The sheer range and style of play will keep you on your toes and satisfy most gaming desires regardless of which part of the game you prefer; action or strategy. Everything comes together in a very nice package in the game and the ability to play both sides of the conflict is really cool. Give it a shot, I don’t think you will be disappointed.